Rajasthan is probably the only state in India which has each and every corner narrating the legendary stories of the bygone era, especially about the freedom struggle. It is called the land of kings for a reason. This beautiful state is the same place where great warriors like Prithviraj Chauhan, Rana Sanga and Maharana Pratap prospered and flourished with their empires for decades. Therefore, it wouldn't be wrong to say that each and every district, city and town of Rajasthan has some connection to these brave kings of India. One place which is strongly related to Maharana Pratap and is immensely popular for its legendary tales is the mountain pass of Haldighati in the Aravalli Range. Read on to learn in detail about its interesting history, why you should visit and how to reach it. The region in and around Haldighati experiences hot summers and hence, it is not a preferred destination during the summer season. If you are looking forward to exploring the best of Haldighati in a pleasant weather, then the best time to visit is from October until the end of March. You can also visit it during the monsoon season, i.e., from July to September, when the temperature conditions are favourable. 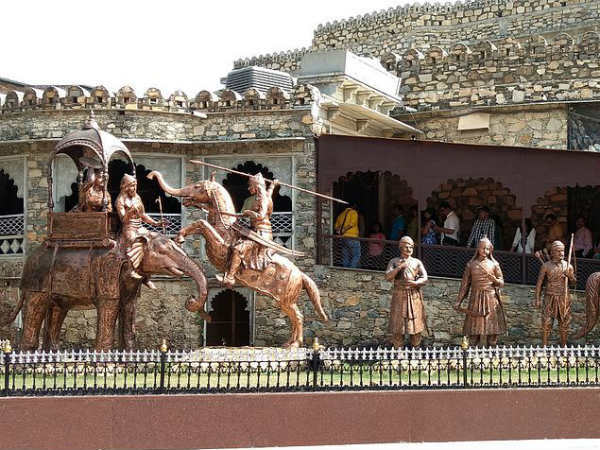 If you are or have ever been a history student, then you must have heard of the historic site of Haldighati in Rajasthan, where the famous battle between Maharana Pratap, the king of Mewar and the Mughals was fought. It is a beautiful mountain pass in the Aravalli Range and has derived its name from the yellow soil in the region which looks like turmeric, i.e., haldi. The Battle of Haldighati was fought in the year 1576 and Maharana Pratap by defeated by Man Singh, the trusted general of the Mughals who was leading the army. The famous horse of Maharana Pratap, Chetak, also played a significant role in the battle and hence you can find a memorial here which was built in the honour of Chetak. Today, Haldighati is a popular tourist place amongst history lovers and is visited by hundreds of tourists every year. Wouldn't you love to get yourself to this historic site which has a lot in store to be explored? Unless you possess zero interest in Indian history and its legendary tales, Haldighati is your calling. Apart from scrutinising the beauty of this historic pass, you can also visit Maharana Pratap Museum here, where you can learn in detail about his life and witness his precious possessions. You can also visit the nearby city of lakes, Udaipur, which is popular for its royal palaces and age-old majestic forts. Due to the increment in tourism in the region of Haldighati, the tourism department has also taken an initiative of hosting private cottages for tourists' accommodation. So, hurry up and get yourself to this legendary place as soon as possible. By Air: The nearest airport to the site of Haldighati is located in Udaipur at a distance of about 50 km. You can get direct buses and cabs to Haldighati from Udaipur. By Rail: If you are looking forward to travelling by air, then the best way to reach Haldighati is by taking a direct train to Udaipur and then from there, a bus or cab to Haldighati. By Road: Being a mountain pass, the region of Haldighati is well connected to other cities and towns by road. Hence, you can easily approach it.